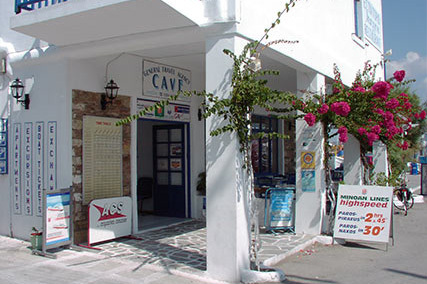 In Antiparos port operates our tourist agency CAVE TRAVEL in which we can help you with anything you need to contribute to a pleasant, comfortable and enjoyable stay.We will enjoy to help you rent a car, or a motorbike to explore the island and print your tickets for your traveling. Also we can arrange your trip to neighboring islands (Naxos, Mykonos, Serifos, Amorgos, Koufonissi) or a trip by boat around Antiparos, admiring natures rare beauties. One other escape is to visit is the sanctuary of Apollo and Artemis in Despotico which is a small island in the southwest of Antiparos and now attracts a lot of ancient Greek beauty fans.